It seems engrained into American history that every fifty years or so, it becomes obvious that we are denying some form of human/civil rights to a minority group, who must make themselves heard in order for the extension of equality. Heck, we’re in one right now. The Butler (also known as Lee Daniels’ The Butler, due to a July 2013 legal battle that ensured us of the fact that Warner Bros. is made out of people who have replaced their brains with dollar signs) is a poignant biopic that packs a real emotional wallop through its sometimes slow 132 minute runtime, all with a strange Forrest Gump­-like feel. Danny Strong’s sweeping (the film starts in 1926 and ends in 2008) screenplay was based on a November ’08 Washington Post article on Eugene Allen (1919 – 2010), a black man who served as a butler in the White House from 1952 to 1986. In this movie, we have a story of a man named Cecil Gaines (FOREST WHITAKER), who was raised on a cotton farm in Georgia in the 1920s and witnessed his father’s murder at the hands of the farm’s owner, Thomas Westfall (ALEX PETTYFER, a charming English actor whose character here is neither charming nor English). After this, the elderly Annabeth (VANESSA REDGRAVE) moves young Cecil to work indoors, and this is where he learns the basics of domestic service, but soon leaves to explore a world beyond the tolling labor that his early life comprised of. After a while, this leads to a hiring at the White House, which occurs at the start of the Civil Rights Movement. With this new challenge, he also has a family. There’s his wife, Gloria (OPRAH WINFREY), a character who I assume is at least somewhat based on Allen’s wife of 65 years, Helene. They have two sons, Louis (DAVID OYELOWO) and Charlie (ELIJAH KELLY), who have various events in throughout the 1960s and ’70s that create a rocky and sometimes tragic private life. Cecil must hide all of this when working, for he is instructed to serve in rooms in such a quick and efficient manner that it is as he wasn’t even there in the first place. He works under several different presidents, from Dwight D. Eisenhower (ROBIN WILLIAMS) to Ronald Reagan (ALAN RICKMAN). The scenes involving the presidents are necessary to character development, but are personally ineffective. You can never shake the fact that it’s Robin Williams telling Cecil to put a bowl of chicken soup on an end table, perhaps because what a pedigree the combined cast creates. Everyone certainly tries their best. Whitaker is in ninety percent of the film’s scenes, and his performance is something to be admired. People have called Oprah many different things over the years, but it is generally agreed that she is an efficient dramatic actress. This comes off loud and clear here. Oyelowo, as the somewhat estranged oldest son of Cecil, bouncing in and out of jail as a result of his involvement of protests, is definitely noteworthy. On the technical front, DP Andrew Dunn frames everything in a soft focus with what looks like actual film stock. Rodrigo Leão’s score isn’t particularly memorable, except for the final minutes. The passing time is highlighted using stock footage (this is how two presidents are represented), which, on a side note, serves as the front for a notably interesting scene involving an episode of Soul Train. 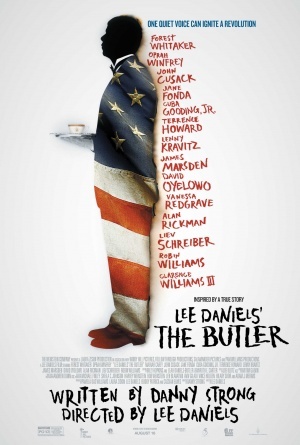 There are two issues with The Butler – the first is the runtime. It does feel a bit slow, in an area that appeared to be congested to the end of act two and the very start of act three. The second is one of tone – the first unabashed awards season movie of 2013 really does feel like an unabashed awards season movie. While not desperate to the point of something like, say, The Cider House Rules­, it is fairly obvious in the way this movie is written and shot – a kind of biopic that emphasizes big acting scenes and writing segments more than most other dramas. Despite this, The Butler is a rich and satisfying movie. It has life and emotion that showers down upon the viewer from humor to grief. It is one well worth seeing and discussing.